What happens when you delete files from External HDD? External hard drive benefits us a lot. We put out favorite movies, music, eBooks, photos and other information on it. But in spite of its uses, we may face lot of troubles during the usage of external HDD. Data loss issue is a representative one. Sometimes when you want to delete this file, but accidentally deleted the other file; Using the same external hard disk on different OS may cause data loss; roughly eject external drive while it is till at work might lead to file deletion. Also, malware attack can also erase the data. However, no need to panic when you accidentally deleted something important because after the deletion, the deleted files actually are still on the hard drive, which become inaccessible and invisible. To get them back, you must stop using the drive at once and make sure you do not add new data to overwrite the deleted files. Then, find a professional data recovery program to retrieve lost data from external hard drive. Using external hard drive data recovery software to recover lost and deleted files from external hard drive is the best solution. With easy-to-use operation steps, user-friendly interface and efficient recovery performance, Coolmuster Data Recovery (for Windows 8/7/XP) or Coolmuster Data Recovery for Mac stands out and becomes the most professional and reliable data recovery program with high quality and security. The tool not only helps you in recovering lost and deleted files, but also helps you to restore files lost by other reasons. Connect your external hard drive to your Mac and launch the Mac recovery program. In the primary window, choose the recovery mode as Deleted File Recovery for you and let the program detect all the partitions and drive letters on your Mac. Then, all the internal and external drives, including your external hard drive will be scanned out and shown on the main interface. Highlight the external hard drive from which you want to recover lost files and click the button of "Scan" to scan existing files in it. After the deep and quick scan process, all files in your drive like photos, videos, music, documents, etc. will be displayed in clear categories. Unfold the categories and preview these files one by one. Mark those you want to recover and click the "Start" button to launch the recovery. After that, the "Path" dialog box will pop up, asking you to choose an output folder where you want to save the recovered data. Just save them on your Mac instead of the original place where you lost them. 1. 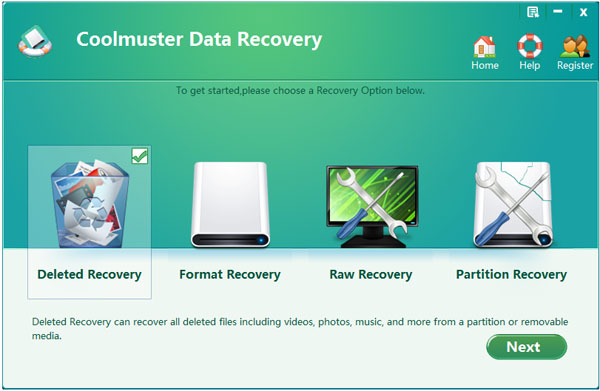 Download, install and run Coolmuster Data Recovery on your PC. 2. Connect your external hard drive to computer and choose Deleted File Recovery. 3. Select your external hard drive from the drive letters and click Scan to continue. 4. View and scanned out files in 2 different viewing modes and mark those you need to recover. 5. Browse for a destination location to save the recovered files and begin the recovery process. External hard drive, also called removable hard drive, as the name suggests is a storage product, which uses hard disk as the storage medium, exchange large capacity data between computers and emphasizes the portability. Most external hard drives comes with fast USB and IEEE1394 interfaces that can higher the data transmission speed. External hard drives are equipped with large capacity, small size, fast working speed and easy to use, etc. There are many famous manufacturers for external hard drive, such as Western Digital, Lenovo, Newman, BenQ, Toshiba, Samsung, Hitachi, BUSlink and so on.